Workshops' information (Workshop 2 by JEMIMA) is updated. Information of technical tour is updated. Plenary talks' information is updated. Information of award and scholarship is updated. The dates of notification of paper acceptance and submission of final camera-ready papers are updated. The deadline of paper submission is extended to April 17 (This is a firm deadline). The deadline of paper submission is extended to April 14. The deadline for submission of Workshops is extended to April 19. The deadline of the organized session proposal is extended to Mar.23. 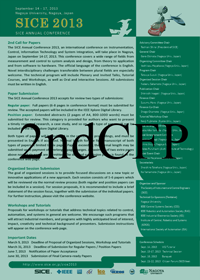 Paper submission site is open. Template files for conference papers are uploaded. Organized Session proposal site is open.